Brachiopods are exclusively marine organisms which first appeared during the Early Cambrian about 540 million years ago. In the Early Paleozoic they were very successful benthic filter feeders adapting particularly to shallow water habitats. Brachiopods are solitary animals that secrete a two-valved shell around their soft bodies. The two valves are of unequal size and symmetrical about a plane that runs through both shells. 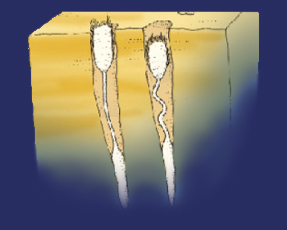 Typically, a pedicle (a fleshy stalk) aids the animal in burrowing and anchors the shell to the substrate. 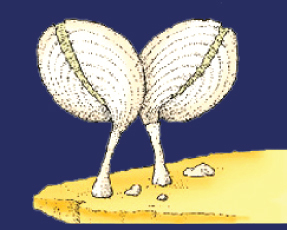 These are primitive brachiopods that do not possess teeth and sockets and their valves are held together by muscles without a hinge. Their shells are made of phosphate and organic chitin. Inarticulates were common in the Cambrian, but declined in the Ordovician as the articulate brachiopods took over. The earliest inarticulate brachiopods were the Lingulides which appeared during the Early Cambrian ca. 540 Ma ago. They are best known from the common living genus Lingula, which lives buried in seafloor sediments using its long pedicle to dig a burrow. They have remained virtually unchanged since the Cambrian and can even be found today in areas around Tolo Channel in Hong Kong (Lingula anatina). 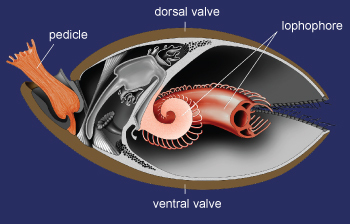 Articulates make up the majority of known brachiopod genera. All articulate shells are made from calcite and possess a hinge mechanism with inter-locking teeth and sockets.